Red dog wearing a blue cape? No, it's the competing cityhood proposals that stand to affect our area! 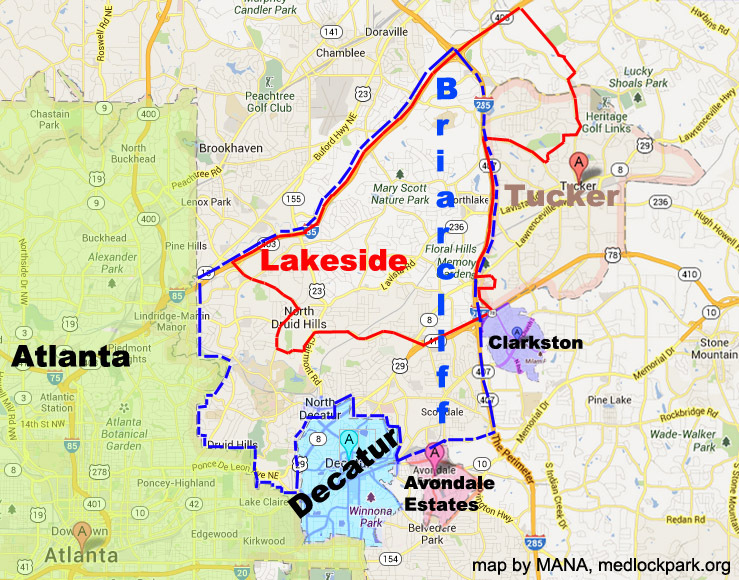 Existing cities (Atlanta, Decatur, Avondale Estates and Clarkston) are colorized and labeled in black. Lakeside proposal is outlined in red, Briarcliff proposal is outlined in a dashed blue line, and Tucker proposal is outlined in pink. Lakeside and Briarcliff boundary lines are slightly offset for clarity--position does not denote different coverage and where they overlap, both are following Hwy 85 and 285. Original map courtesy of Google. Please report any inaccuracies to medlockassoc@gmail.com so that we may better inform our readership. As noted in the MANA editorial below [to appear in our next newsletter], the time has come to form an opinion about the future of the region. Georgia law specifies that before a cityhood proposal can be brought to the legislature, it must include a financial viability study, and the City of Briarcliff Initiative is collecting funds ($30,000 needed) to commission said study from the Carl Vinson Institute of Government at UGA. Since MANA is included in the Briarcliff proposal, the MANA Board has voted to contribute towards this study. If the study is not commissioned, funds will be returned to the donors. The Lakeside City Alliance (whose proposal excludes MANA and CHCA) is likewise collecting funds for a feasibility study. Many of us have opposed the creation of a city including our part of the county, preferring to remain in DeKalb County, but events have made it necessary to reconsider that opposition. Momentum and political power seem to be on the side of a creation of a Lakeside City. This proposed city does not include the Medlock or Clairmont Heights areas and would isolate us politically from much of the rest of the northern and central section of the county. We do not know how that would affect our property values, levels of service, or taxes. We, of course, can choose to do nothing. Or we can support the study for the proposed new city of Briarcliff, which pays tribute to the interests of our area. If the legislature chooses to accept neither of the cityhood proposals, then we continue as we have. 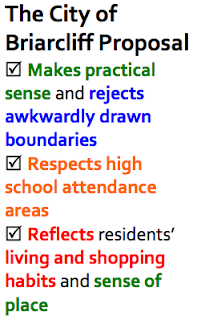 If the Briarcliff initiative passes the legislature, we can vote our preferences. If the Lakeside City initiative passes the legislature, we will have no say at all. For now these seem to be our choices. A new formal organization now exists to “investigate and study the possibility of forming a city within unincorporated central DeKalb County, Georgia.” This proposed city of Briarcliff would include most of unincorporated DeKalb County inside an area outlined by I-285, I- 85, and the city limits of Decatur and Atlanta. The new city overlaps much of the already-proposed Lakeside City Alliance map but adds neighborhoods and sections left out of that proposal; it was created by a group that includes representatives from many neighborhoods and civic associations in the relevant sections of the county. As a result, Briarcliff constitutes what proponents claim is a more logical and inclusive entity for a city in DeKalb County. 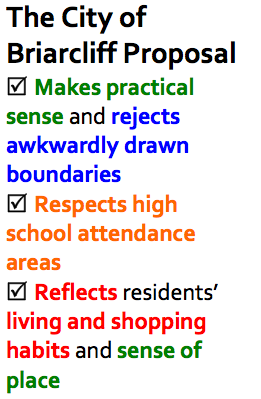 There are several steps in the process of cityhood. Georgia law requires that to be called a city an entity must provide at least three of the following services: law enforcement, fire protection/fire safety, road and street maintenance or construction, solid waste management, stormwater collection and disposal, electric or gas utility service, code enforcement, planning and zoning, and recreational facilities. Georgia law also requires that there be a study of the feasibility of any new city to provide the services it requires and pay for them. This study costs $30,000 and must be conducted by a properly- recognized organization like the Carl Vinson Institute at the University of Georgia. Work on the study must begin by July 1, 2013, so that it can be completed in time for the next legislative session. This is a crucial first step towards cityhood. Fund-raising has already begun. Once a study has been completed, the legislature then must decide whether or not to authorize a referendum on the proposed city. Our understanding is that no more than one proposal for the same general section of the county would pass. If the legislature approves the plan for a proposed city, the people directly affected will have their say in the referendum. No one else in the county would vote on the issue. As a result of the concerns stated above, the MANA board has just approved supporting the study for the City of Briarcliff by contributing $1000 to the cost of the feasibility study. The board is also offering up to $500 in matching funds for contributions from the neighborhood. Details about the match are still being worked out and will be available at the MANA web-site at http://www.medlockpark.org/ They will also be discussed at the MANA Community meeting on June 17. We emphasize that we are supporting the study, not necessarily the city itself, because we believe this option gives all of us more opportunity to have our voices heard. Otherwise, events may overtake us before we have a chance to decide for ourselves. Since this situation is very fluid and extremely important to our neighborhood, we urge you to keep up with the local news about it, as well as information on the MANA web-site and the Civic Association Network site at http://www.can-dk.org/file-cabinet/government-municipal. At a meeting in early May a representative of the City of Decatur stated that they are still interested in annexing certain (unspecified) commercial areas to increase the percentage of revenue they get from businesses and “straighten out” their borders.